The Saturday Night Live (SNL) “Diner Lobster” skit was really about folks at a diner trying to get their customers to buy the tuna melt. Just think about it! Who gets the tuna melt whenever they go out to eat?! No one does! The tuna melt is nasty! It taste the way it looks which is like slop! The folks over at Big Nick’s Greek Diner know this. That’s why they’ve developed the perfect plan to sell the tuna melt. And that plan is to place lobster on the menu. Now…everybody knows that no one buys lobster from a diner. It’s a diner! The folks working in diners serve the working man’s food. Food like hamburgers, French fries, grilled sandwiches, chicken, steak, and potatoes. Stuff like that. The working man can’t afford lobster. That’s food for folks who make a seven figure plus salary, not food for po’ folks like us! 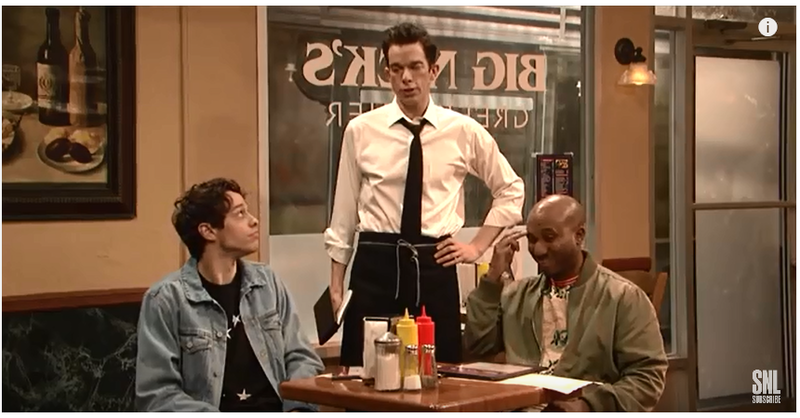 So, when Pete Davidson’s character ordered the Lobster, the waiter (John Mulaney) gave him a “huh” look. Sure, Davidson’s character, as he says, won his lawsuit against Bumble because they couldn’t find him any matches. But hey, he was in a diner. And folks don’t order lobster in a diner. Hell, even the rich folks who stop at a diner know it’s the best place to go and get a hamburger, not a lobster roll. SNL highlighted this point by having the folks at Big Nick’s Greek Diner to sing a little tune, letting folks know the trouble they’ll get their “bowels” into if they eat lobster at a diner. “Do you hear the lobster scream? Screaming the scream of scalding flames? It is the screaming of a lobster and this dummy’s here to blame. When the churning in your bowels matches the burning of his shell, you’ll know why lobsters in a diner never sell,” is what the folks over at Big Nick’s Greek Diner decided to sing. After listening to that, Davidson decided he better go with something that agrees with him. So, he told the folks over at Big Nick’s Greek Diner, “All right, all right forget the lobster, I’ll have a tuna melt instead;” which is exactly what they wanted him to have in the first place.